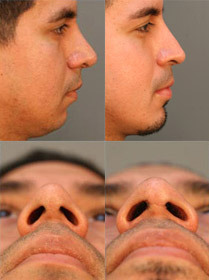 This patient was having breathing issues and wished to improve his nose. He also wanted to improve the appearance of both his under eye and submental area. Post-operative photos reveal a more aesthetically pleasing profile and a refreshed look to the eyes. Patient has reported better breathing as well. This patient wished to reduce the appearance of her nasal hump and fix her deviated septum. 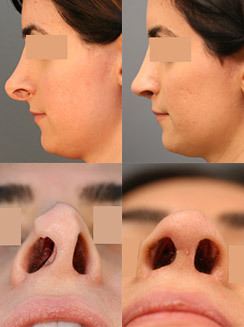 5 month post-operative photos reveal an improved nose, and the patient has reported better breathing. Patient continues to heal. 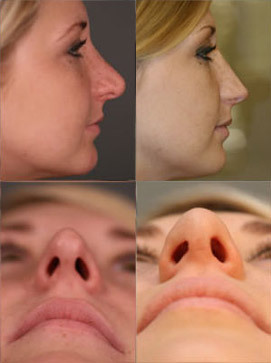 This patient wished to soften the appearance of her nose and correct the outcome of a previously unsuccessful rhinoplasty (different surgeon). 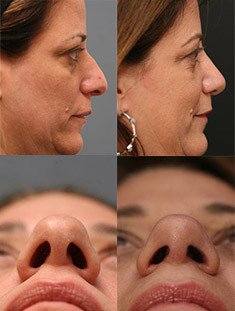 Post-operative photos reveal an improved nose, and the patient continues to heal. 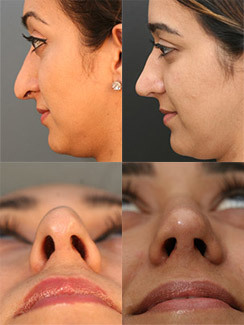 This patient had an unsatisfactory result from a previous rhinoplasty. 5 month post-operative photos demonstrate a dramatic improvement. 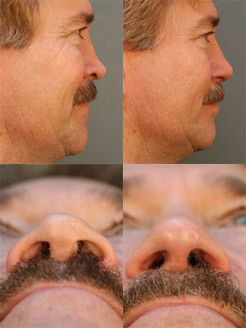 The patient demonstrates a more aesthetically pleasing nose and has reported better breathing as well. This patient wished to reduce the appearance of a nasal hump. She also had a deviated septum that affected her airway. Post-operative photos demonstrate an improved cosmetic appearance. Patient has also reported an improvement in breathing. 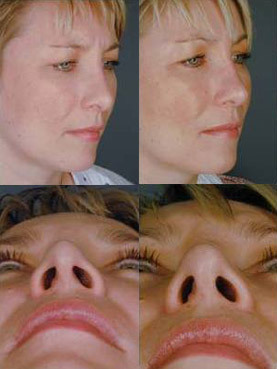 This patient wished to improve the appearance of a nasal hump and fix her breathing. 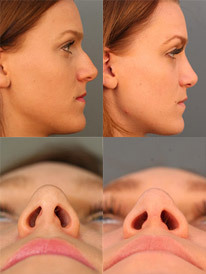 Post-operative photos demonstrate a more aesthetically pleasing nose. The patient’s open airway has led to an improvement in breathing as well. 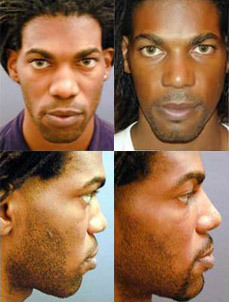 36-year-old African American male desiring a “westernization” rhinoplasty. He has an ethnic nose and wants it thinner and desires more projection. Notice the improved but not over-corrected profile with more projection and slimmer nasal tip. The patient did not desire nostril narrowing which would have narrowed his nose slighty more. This patient wished to fix a deviated septum, and improve the overall appearance of his profile. Post-operative photos reveal a softer profile, and improved breathing has been reported as well. 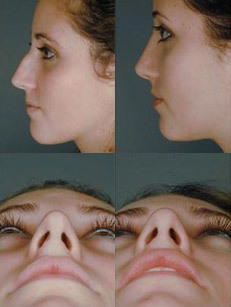 This is a patient who wished to improve her nose structurally and functionally following a previously unsuccessful rhinoplasty (different surgeon). 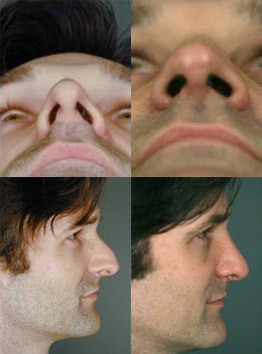 Post-operative photos reveal an improved nose and patient has reported better breathing. Patient continues to heal. 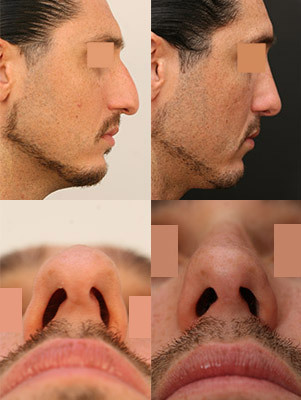 This patient was having trouble breathing and wished to improve the appearance of their nose, and correct the results of two unsuccessful previous rhinoplasties (different surgeon). Post-operative reveal a softer profile. Patient has reported improved breathing as well. Patient continues to heal. 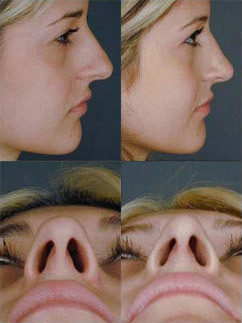 This patient wished to improve the appearance of her nose and fix her deviated septum. 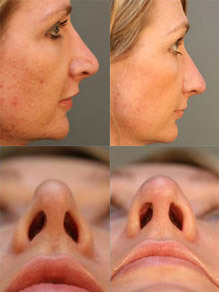 Post operative photos reveal an improved nose and softer profile. Better breathing has been reported as well. Patient continues to heal. 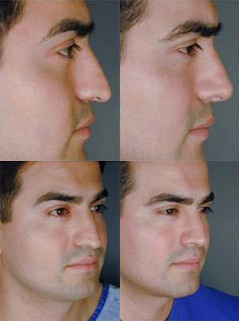 Hispanic male desiring a smaller, less “droopy, pointy” nasal profile. Mediterranean female desiring a softer nose. 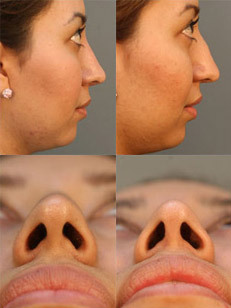 Notice the softer nasal tip didn’t give this patient a “different” nose. 14 year old female complaining of a “very wide” bridge in addition to nasal obstruction. 15 year-old female desiring improvement of her nasal obstruction and to soften the nasal hump. Taylor also is a singer and with a better airway, she feels that she will be able to project her voice more and gain more clarity. Male hispanic patient desires a softer without a dramatic change. He also desires to have his nostrils narrowed. Female patient unhappy with her nasal tip and left middle vault. 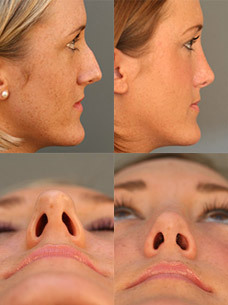 She has had approximately 8 rhinoplasties and had goretex placed over her left middle vault. 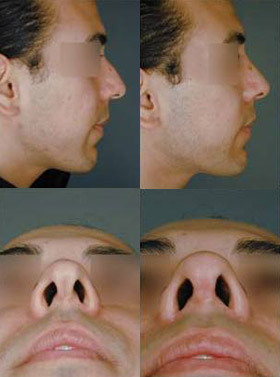 Young man unhappy with the appearance of his nose and with problems with nasal obstruction. Costal (rib) cartilage was used for the reconstruction and a medial crural overlay of 3 mm was performed to deproject the over-projected nasal tip. The 14 month post-op photos reveal a smoother profile. 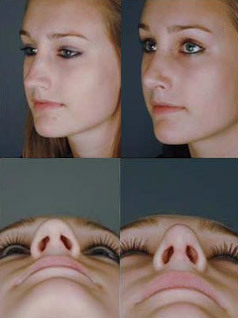 The frontal view is more symmetric; however, nasal tip edema is still resolving.